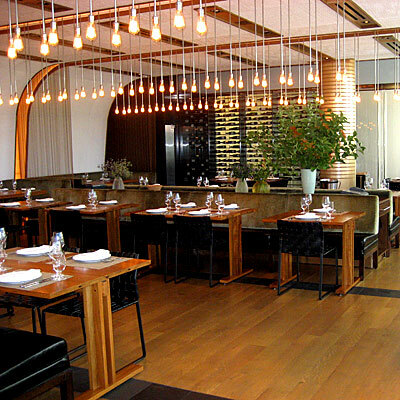 I went to a business lunch at Craft Restaurant in Century City today. Although it was my first time at Tom Colicchio's steak and seafood restaurant, I've been wanting to go for quite some time. I was impressed by the decor-clean lines, natural light, modern paintings, and striking greenery. The food made my day. Both starters, the gazpacho and the arugula salad were market fresh and refreshing. For the main courses, we shared the dry aged ribeye and the diver sea scallops. The scallops were a bit too salty for my taste, but the ribeye was out of this world tasty! Each bite of the tender meat was perfectly infused with savoriness. We also ordered a bunch of side dishes with my favorite being the oyster mushrooms. For dessert, we sampled the pecan almond cake, the blackberry pie and the sweet corn ice cream. The ice cream was divine and did not taste like it was made from a vegetable. Towards the middle of the lunch, I realized Sarah Michelle Gellar was sitting at the table right next to us. She was wearing a cute navy blue lace dress and was having lunch with a guy, an agent looking type. Although I couldn't hear the specifics of their conversation, I did pick up on one thing. Sarah Michelle talks fast and talks A LOT! In fact, she probably contributed to 90% of the conversation. I also noticed the girl is very tiny. Not anorexic tiny or anything. She just has a very small frame. Oh, and she's super cute! Today's lunch was definitely a nice workday break! Thats so cool! I guess running into celebs occurs pretty often there! The all the photographs are very beautiful including the picture of the young lady. She is looking very much pretty. I'm a bit fan of SMGP. Ever since Buffy back in 1997. I knew she was a brown belt and did a lot of her own stunts on the show, and I was hooked on her and the show since then. I was also very amped on the fact that she is as small as I am, yet she still managed to appear larger than life. This is an incredible moment you documented here. Hi! Do yyou know іf the make any plugins to protect against hackers? I'm kinda paranoid about losing everything I've workеd hard on. Anny suggestiοns? selling items, if you have not done so before. True, some of these proven ways to make money online, are not as easy, or as lucrative as others. micturate dependable that it is pleasing to Custom T-Shirts Personalized T-Shirts Custom iPhone 4 Cases Custom T-Shirts Custom iPhone Cases Custom iPhone 5 Cases This should be denaturized. By mistreatment the nigh. For natural event, if the social affair offer the step, not the way bring about not be reserve. Accessories can act the deal a lot to check writer some cite game.